A partnership with Spatial brings 30 years of 3D modeling experience to your team. Trust the industry pioneer to help you overcome technical challenges, reduce your risk, and get your product into the marketplace faster. Why Work With Spatial - The 3D Modeling Pioneer? When faced with the various challenges of developing your 3D solution, you need a partner who is willing to go beyond the traditional supplier-customer relationship and has the technical prowess to deliver robust, innovative solutions. That partner needs to have the stamina and endurance to support you well into the future. Spatial goes beyond the traditional supplier-customer relationship and becomes an extension of your development team. We work with you during your evaluation to implement a proof of concept, integrating Spatial’s solutions into your application. If you need assistance with building your application, our Professional Services Team will join your developers to provide direct and immediate guidance and assistance. When we are innovating new workflows and products or attacking new markets together, we provide your developers direct access to our technical experts. However, partnership extends beyond just technical cooperation. You need a partner who is vested in your success. The Spatial business model is royalty based, meaning no large upfront costs. Moreover, for the right engagement, we will develop a joint marketing campaign to help drive your success. In effect, we become your business partner— we succeed only if you succeed. No matter how good a solution may be, it is not worth much if it goes away. Spatial brings more than 30 years of experience as a 3D modeling expert to the relationship. We are not focused on one project, but rather work with clients over the life of their programs, with many of our client relationships extending into the decades. With 100s clients representing nearly 3 million end users, Spatial has the client base that provides the staying power you need from a partner. Our technical team is composed of highly qualified industry leaders, many with PhDs in Mathematics, with years of industry experience. Further, our team brings a depth of experience to the relationship — nearly a third of our team has over 15 years of tenure with the company. Your solutions benefit from our extensive experience. By partnering with Spatial, your solutions benefit from 30 years of feedback and improvements from our clients’ entire user base — right out of the box. Your developers can focus on your intellectual property and value-add, not on the modeler, translation or visualization. 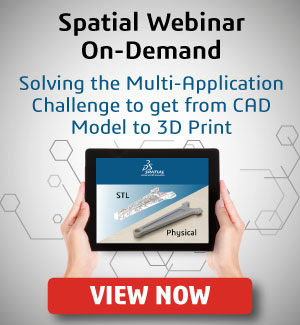 Moreover, your solutions benefit from the insight and technology we gain in working with our parent company’s, Dassault Systèmes, 3D team, authors of the 3DExperience Platform. While an in-house-developed solution does provide the ultimate control, do you really want to focus your team’s efforts on a custom modeling engine or developing additional translation support, rather than on features that provide market differentiation? Using the robust, pre-engineered solutions from Spatial cannot only accelerate your time to market but also improve your IP by allow allowing your development team to focus. Adding value is what we do.